Washer packed in last week and been looking around instore and online. Came across this. Seems really good value for the money. Samsung seems to be well thought of and should be better than any hotpoint, hoover, beko etc that you will be looking at for this price point. I've ordered one anyway. Comes with Samsung 5 year parts and labour warranty which I have read through and seems good to me . Its a few £'s cheaper than most other places so a good deal. got a similar one earlier this year (mine had an 8 in the model number). Can't fault it. is this better than the curries one? someone who has the currys one says it's got a design flaw with the inlet valve.. does this model also have the same problem? Samsung seem to do a crazy array of washing machines. Seems they have gone a bit to far when a few less would do the job and at the same time become cheaper. Only 1200 Spin speed. I have a 1400 and it's still way wetter than I would like. My mother has a 1600 and it's almots dry when it comes out. Can Anyone who has one of these, let me know how wet the washing is after a wash.
im used to a 1000 spin so this will be ok for me. I to have a 1400 speed (Zanussi (12 years old!)) but it shakes around all over the place at that speed so I use 1100revs instead and the clothes only take 6 hrs to dry on a clothes rack. Great for night time drying. it can spin at 5000rpm & the clothes will still come out wet! Seems a good price with a 5 year warranty, BUT I'd suggest you check that before ordering as the details seem ambiguous and when you go to checkout it mentions nothing about a 5 year warranty being included, but lets you add it for an extra £195! Can anybody confirm if the warranty IS included? Seems a good price with a 5 year warranty, BUT I'd suggest you check that … Seems a good price with a 5 year warranty, BUT I'd suggest you check that before ordering as the details seem ambiguous and when you go to checkout it mentions nothing about a 5 year warranty being included, but lets you add it for an extra £195!Can anybody confirm if the warranty IS included? The free warranty is from Samsung direct not the one Electro Centre is selling. I beleive you have to apply for the free 5 yr warranty with Samsung after purchase. Yes go through Samsung for the warranty. Hot for the 5 years warranty alone. Yep thanks - I've found that now. Seems like a bargain with the warranty, just a little put off by the long wait times that somebody has experienced when they had a problem withy their Sammy WM. Might just be a one-off mind. When all is said and done, seems like a winner. Just wonder why the model with an extra 1kg load costs £200 more?! This one has good reviews. But don't washer/dryers generally suffer from problems? I thought that's why people usually have separate washers & dryers - that's what I've always heard. Friend has the 1804 and loves it. Got after a deal on here - from Boots i think. Hot! This one has good reviews. But don't washer/dryers generally suffer from … This one has good reviews. But don't washer/dryers generally suffer from problems? I thought that's why people usually have separate washers & dryers - that's what I've always heard. 12 years and still going strong my washer/dryer altho' I don't use the dry function that often. And mine was a B model that I bought from a local store at knock down price! (looked just like new tho'). 12 years and still going strong my washer/dryer altho' I don't use the … 12 years and still going strong my washer/dryer altho' I don't use the dry function that often. And mine was a B model that I bought from a local store at knock down price! (looked just like new tho'). Well there you go. Still, my washer/dryer is still going strong after 25 years! Beat that! Having said that, it's starting to show its age, is becoming more and more temperamental and doesn't perform anywhere near as good as a newer/younger model. Yep thanks - I've found that now. Seems like a bargain with the … Yep thanks - I've found that now. Seems like a bargain with the warranty, just a little put off by the long wait times that somebody has experienced when they had a problem withy their Sammy WM. Might just be a one-off mind.When all is said and done, seems like a winner. Just wonder why the model with an extra 1kg load costs £200 more?! Which model? I can't see it in the list, not for £200 extra. Sorry, I was referring to those at Currys. All getting confusing now! Phew!! I've been right slapped. When I nearly replaced it with a Sammy a few weeks ago from the Comet sale (just because I could). 13 years plus is a long time to wait - can you hang on? 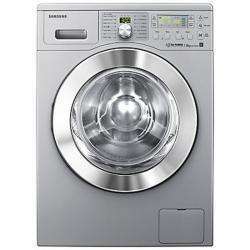 is this better than the curries … is this better than the curries one?http://www.hotukdeals.com/deals/samsung-wf1704wse2-ecobubble-washing-machine-with-5-year-warranty-329-99-currys-1423381someone who has the currys one says it's got a design flaw with the inlet valve.. does this model also have the same problem? Electro centre just rang me and said they will install and fit and remove the old one for fee aswell. Its meant to cost extra for that. I should imagine a Samsung would be very reliable and the warranty backs it up. I've got a 1600 spin zanussi which is great but as someone else said I don't think there's much difference from 1400 and 1200 is probably good enough. Electro centre just rang me and said they will install and fit and remove … Electro centre just rang me and said they will install and fit and remove the old one for fee aswell. Its meant to cost extra for that. For "a Fee" or "for Free" ?? This model cheaper at b and q. Link please???? It's £294.95 when the 15% discount is applied. B+Q only offering a 2 year guarantee too. mart321 Electro centre just rang me and said they will install and fit … mart321 Electro centre just rang me and said they will install and fit and remove the old one for fee aswell. Its meant to cost extra for that.For "a Fee" or "for Free" ?? Considering all they have to do is take it out the packing and attach one pipe I guess the money they make from selling your old one for scrap makes it worth it! [quote=djfluff] mart321 Electro centre just rang me and said they will … [quote=djfluff] mart321 Electro centre just rang me and said they will install and fit and remove the old one for fee aswell. Its meant to cost extra for that.For "a Fee" or "for Free" ?? thanks, I was thinking along the same lines. also with currys there's a £20 fitting service that I'd definitely need, and they recycle the old machine for free. it seems with electro centre they will only deliver to the ground floor, which is a no no for me as I'm in a second floor block off flats with no lift. only thing i'm not sure about at the moment is the depth being bigger than standard worktops..
can the 15% discount be used on washing machine -i have it in the checkout buts theres no discount applied??? If you want dryer, go for hoover. Very economical to run!